No matter how good your instincts are as a blogger, real success comes from careful planning, not a series of in-the-moment decisions. And that means having a content strategy. It’s the linchpin that makes everything work together. It’s what helps you build momentum to continue to grow over time. 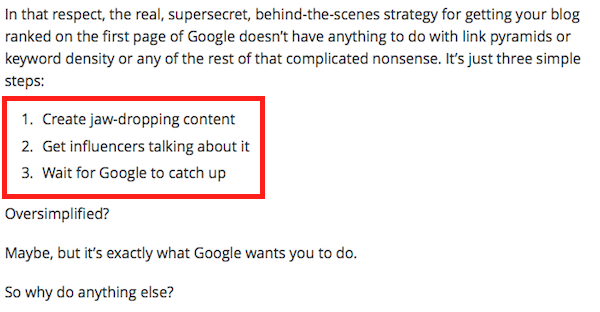 So what exactly is a content strategy? Research from Content Marketing Institute and Marketing Profs shows that those with a documented content strategy consider themselves more effective with their content and social media channels. But even though the data indicates that a strategy is essential for building a successful blog, the vast majority of bloggers don’t have one. No bueno. Bloggers have an abundance of choices. They have almost no limit to the number of possible tactics that could move the dial on their blog. But the paradox of choice is that when you have many options available to you, it becomes difficult to choose between them. 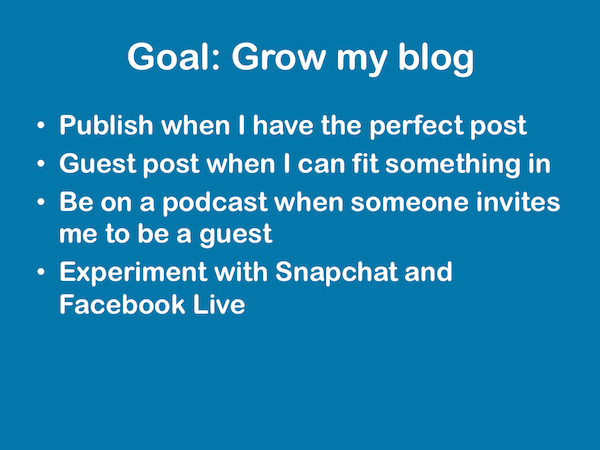 Here are a few of the decisions you face when it comes to growing your blog. First, there’s the medium. 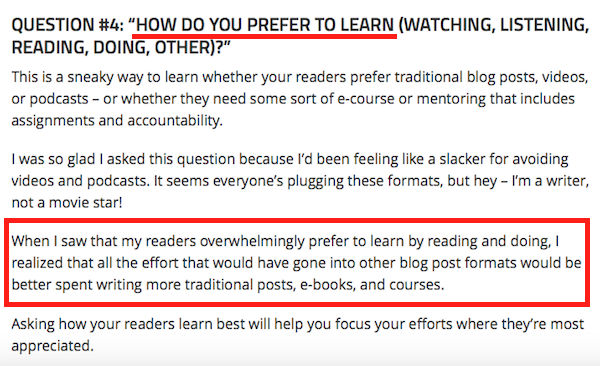 Should you only blog? Podcast? Make videos? How about all three? Then there’s the format. 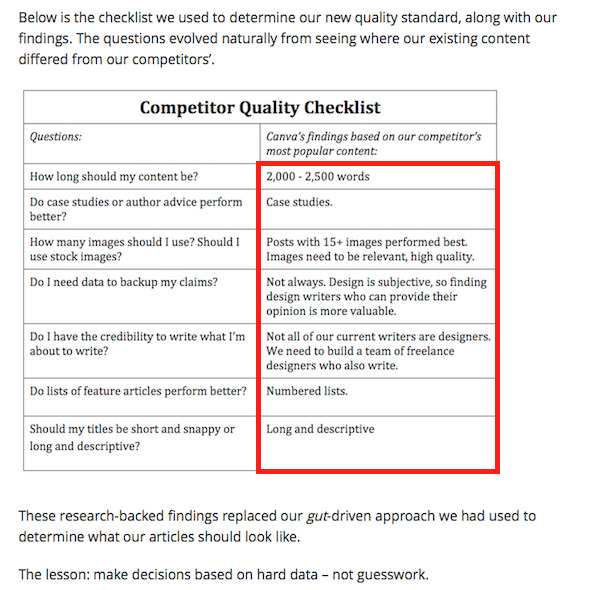 Should your content be long and detailed like the posts here on Smart Blogger? Or should they be short and pithy like Seth Godin’s posts? 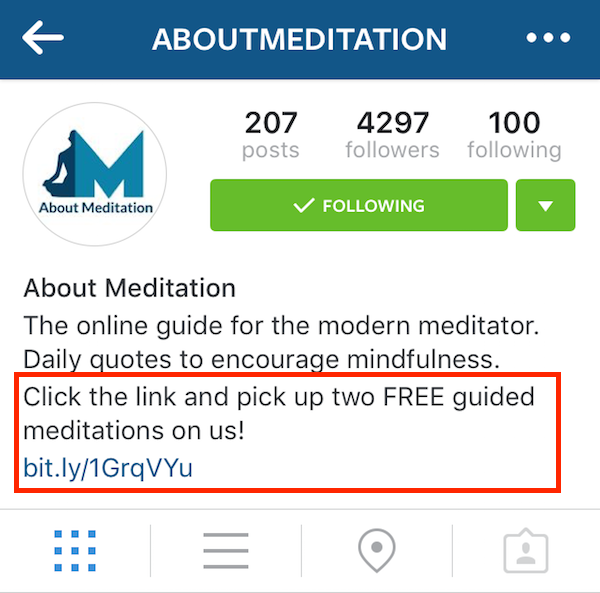 Or perhaps you should curate the content of others? And what about frequency? 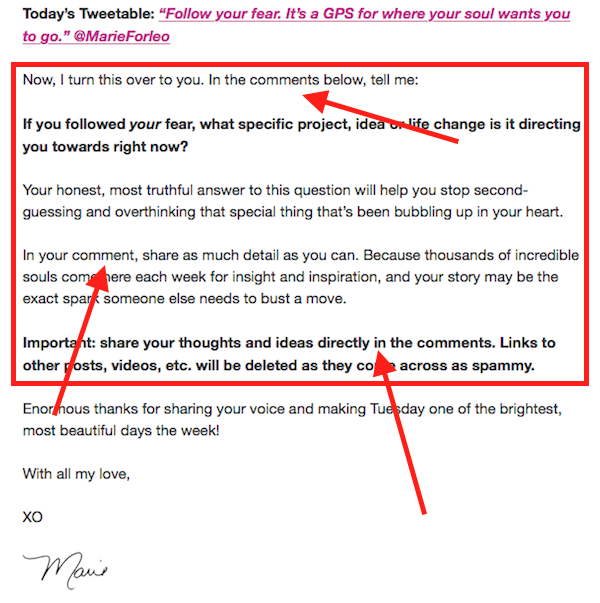 Should you post daily, weekly, or only when you have something truly epic to say? 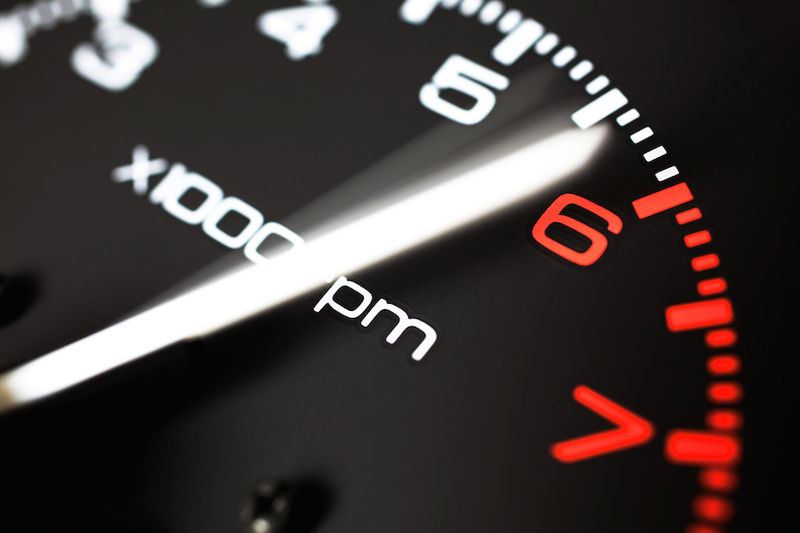 Then there’s the equally important task of how you drive traffic to your blog. Here too you have multiple approaches when it comes to figuring out the right plan for you. The result of having so many options is always the same. You end up paralyzed, anxious, and wasting time. When you compare the two, it’s easy to see which approach will likely yield tangible results, and which will leave you floundering in a sea of randomness. When I worked my corporate job, our annual business planning was a long, grueling process over the course of four to six weeks. The good news is creating a strategy for your blog doesn’t require the same level of pain. All you have to do is follow a framework that charts a clear path to get you to your goals. In building your content strategy, your first choice should be deciding on your objective. Specifically, you have to get clear about why your blog exists, by defining your ultimate goal. Smart bloggers blog for a definitive specific reason. What’s yours? 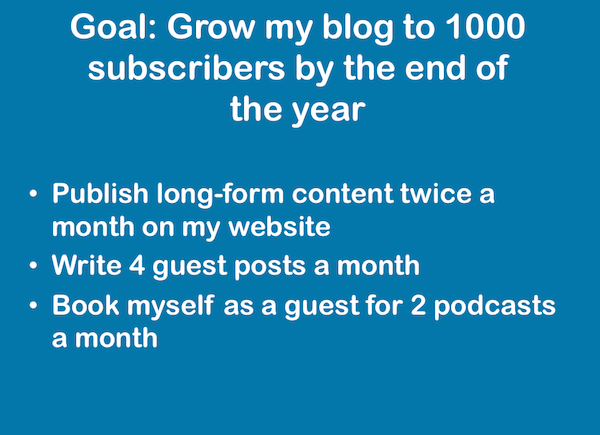 Next, take this “big prize” that you are working toward, and break it down into specific targets you need to achieve to grow your blog along the way. This will help to guide the strategy you create for your content. Your strategy may need to adapt as you hit each important milestone, so it’s a good idea to revisit your content plan after you hit each one. Every decision with your blog must begin with your readers. You’ve got to consider their likes, dislikes, and needs, as well as their dreams, desires, fears, and frustrations. If you’re tempted to ignore this step, assuming you know everything there is to know about your audience, don’t. This is the glue that makes everything work. “Your ideal reader should become like an imaginary friend. You should know your ideal reader so well that you can start a conversation with her at any time. You know when she shakes her head because you say something she doesn’t agree with. You know what makes her smile or laugh. You know the questions she asks. You know how to charm and flatter her. Once you’ve got a strong handle on who your audience is, you can use that information to guide your content strategy. 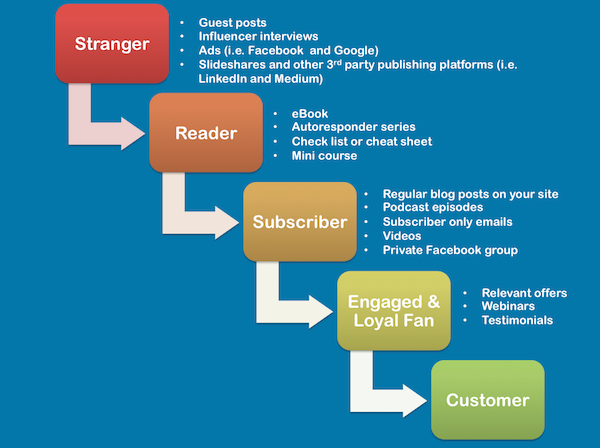 Your content plan will serve as a “conveyor belt” to help you move your audience along the various steps in the journey that leads you both to your goals. Because when you think about everything you publish not simply as “content” but as a catalyst for a specific change, your approach to blogging will shift. Great content transforms your readers. 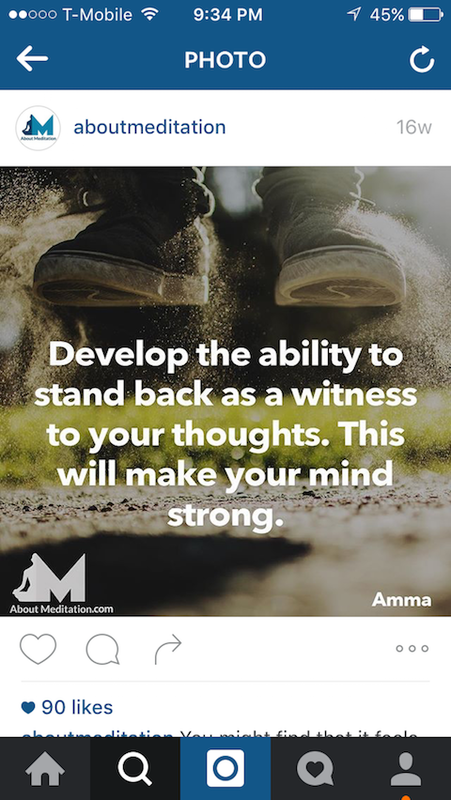 And that transformation should progress both you and your audience toward your respective goals. That’s why every piece of content you publish needs to have a purpose. To induce this change, you need to know what issues are dominating your readers’ thoughts, as well as what they need to move to the next step with you. This will help you determine what type of content to give them. Matching the right content to where your audience is on their journey with you is critical to helping you get results. And here’s an example of that playing out in the real world. 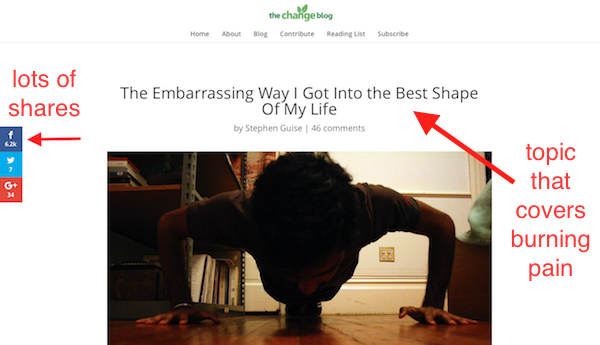 In this guest post on The Change Blog, international best-selling author Stephen Guise uniquely addressed a common burning pain of his ideal reader: getting in shape. As a result, he was able to turn thousands of strangers into readers. 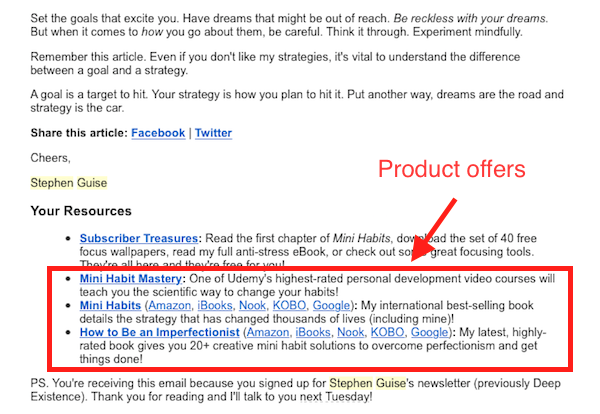 By offering a free chapter of his book on mini-habits, the strategy he wrote about in his guest post, Stephen was able to convert a good number of those new readers into subscribers for his blog. Every Tuesday morning when he sends an email to his list, he works to turn those subscribers into loyal fans by continuing to address topics that interest them. And some of those fans become customers whenever he releases a new book or reminds them of other books and courses he has available that are in line with their needs. When deciding what content to give your audience, you’ll also have to determine the best format. There are basic choices such as the medium: i.e., text, audio, or video. But there are tons of other considerations too, including length, use of images, and even if your blog post should be a listicle, case study, or tear jerker. Before you get overwhelmed, take comfort in knowing there’s a simple way to discover which choices are ideal to help you grow your blog. Let the data decide for you. Mining the comments you’ve received on content you’ve already published can give you clues about what your audience is most receptive to. 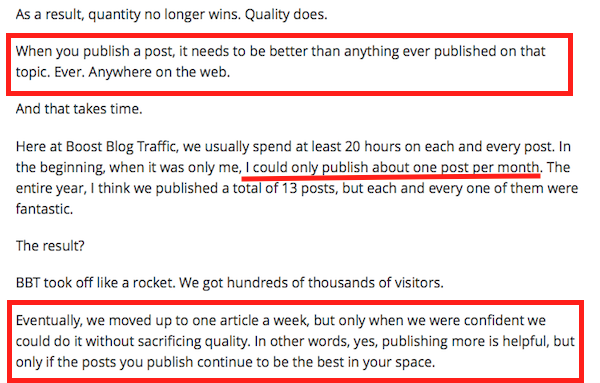 Andrew Warner at Content Ranked publishes long-form posts. Based upon the gleeful comments he received, his audience is hungry for more content with the same level of detail. You could also ask your audience what their preferences are. 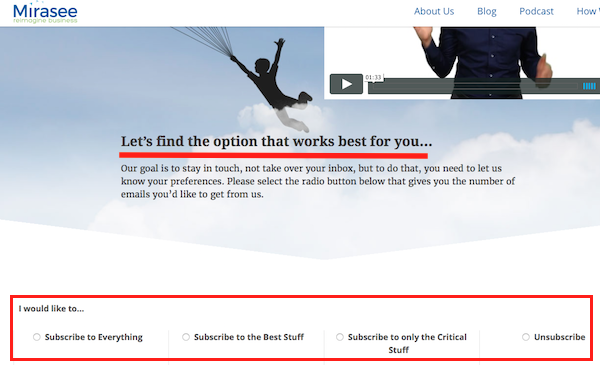 In this post, Linda Formicelli used a simple survey to figure out if her audience wanted her to branch out into audio and video content. And in this case study, Andrianes Pinantoan, detailed how Canva used 3rd party data to figure out the ideal post length, type (list post), and even the number of images they should include in every article. By doing research on their competitors’ most popular posts, using forums to identify new ways to tackle common issues, and capturing insights on what their readers were already sharing, they were able to create a profile of the form their content needed to take if they wanted to grow. As with the format, the objective of each piece of content plays a role in channel selection. If your goal is engagement with your audience, then publishing on your blog or sending an email to your subscribers is the way to go. 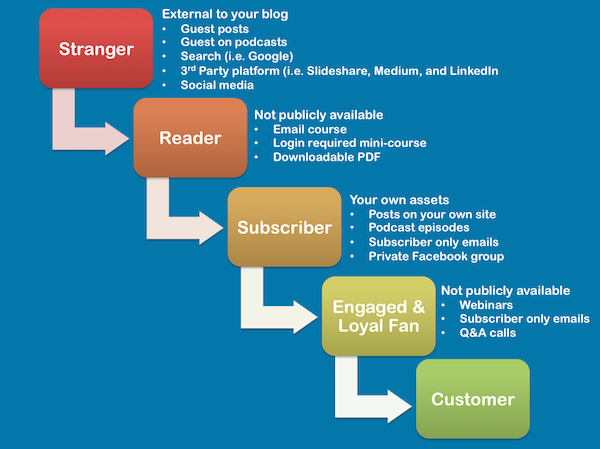 If you are trying to reach a new audience, you’ll need to select a channel that lives outside your blog. 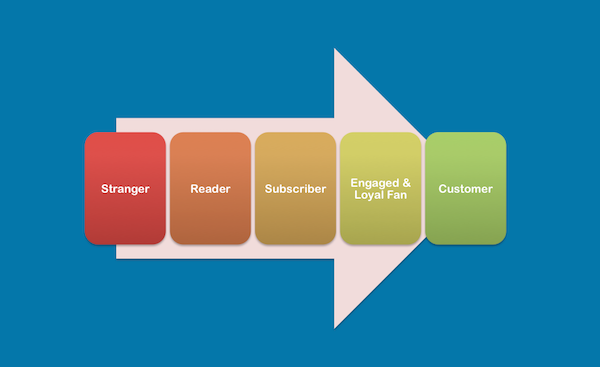 Here’s a way to think of which channels are most appropriate for each stage your audience goes through. 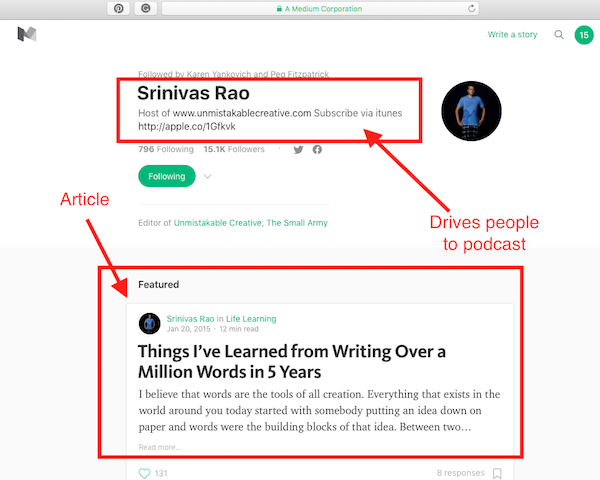 Srini Rao, host of the Unmistakeable Creative podcast, publishes blog posts on Medium as a way to get new listeners. Because creating great content can be so time-consuming, consider publishing different elements into different channels to get as much traction as possible out of the core pieces you produce. 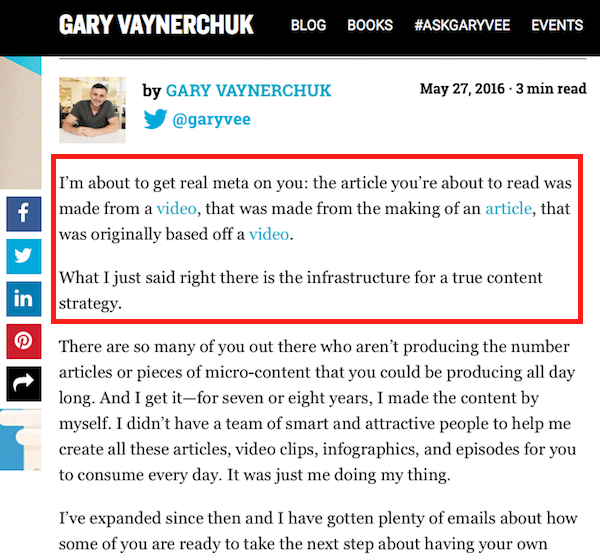 Gary Vaynerchuk swears by this repurposing strategy. From his core content pillars of The #AskGaryVee and Daily Vee shows, he and his team make several pieces of content reach different audiences in different places. Jay Baer of Convince and Convert does this as well. 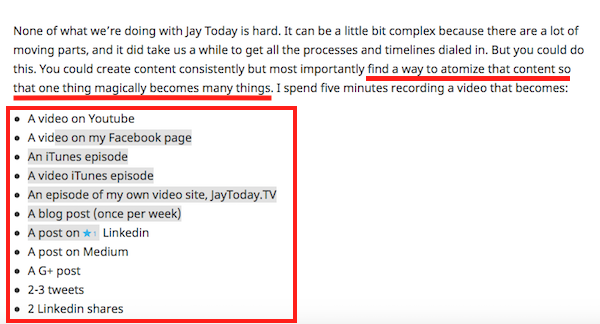 Three times a week, Jay publishes a three-minute Jay Today video. And each video becomes eight different pieces of content. It’s part of what they call their “atomizing” strategy. Have you ever met someone, hit it off brilliantly, then failed to stay in contact afterward? That relationship would have had a chance to develop if one of you had been more intentional about keeping it going. In growing your blog, you can’t expect your audience to actively build the relationship. It’s up to you to provide consistent communication to maintain the connection with your audience. The key is to set expectations so they know when to expect to hear from you. 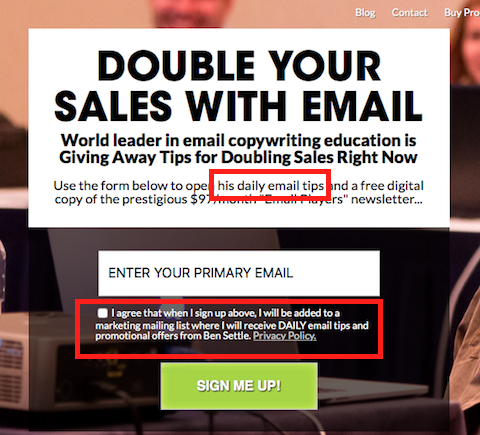 Ben Settle emails his subscribers daily and is very clear in making sure that people considering signing up to his list are aware of how often he will show up in their inbox. Even if daily contact seems too much (and it probably will be for most bloggers and audiences), it makes sense to email your subscribers more frequently in the beginning. Many smart bloggers will automatically add new subscribers to a short welcome sequence before falling into a regular schedule of sending their latest blog content. 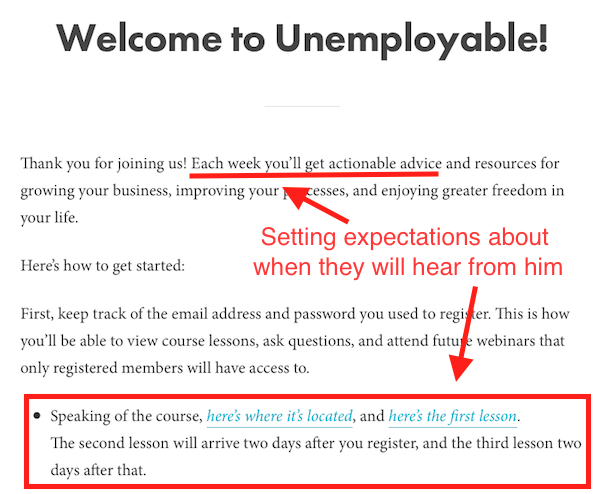 Brian Clark sends new subscribers to his Unemployable list a series of three emails as a part of a mini-course, and then transitions into weekly emails. Once into your normal publishing schedule, the ideal frequency for you and your audience will be determined by a variety of factors, including their preferences, and how much time you need to produce quality content. Your aim should be to email often enough so that your audience remembers you and is happy to hear from you, but not so much that they are overwhelmed with all your messages. 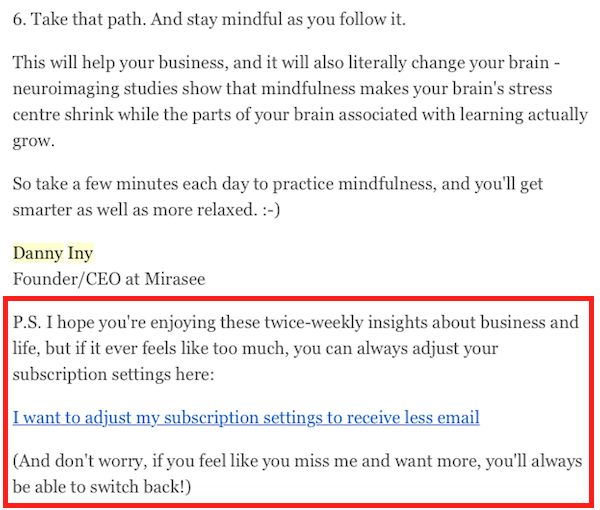 Danny Iny and his team at Mirasee email their audience six days a week. But for those in their audience who feel like six messages are too much, they give them the option to receive fewer messages. And if you’re unsure about what the right frequency is for you, err on the side of publishing less often, and make sure that when you do post, it is the best content you can possibly write on the topic. 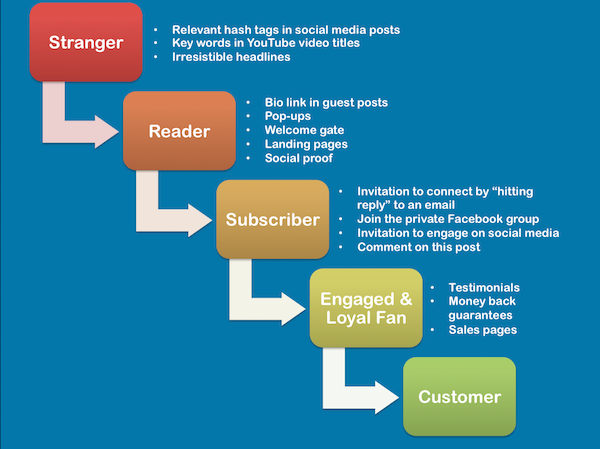 Another major consideration is how you will get people beyond your subscribers to see your published content. There are six common ways to do that – you can use one approach or some combination, but each has its pros and cons. If you’ve got money to invest, this can consistently bring qualified leads to your blog. Facebook Ads can be complex to setup but very successful once up and running. If your content ranks for a relevant term, it can bring a steady stream of traffic from people searching for the topic you write about. 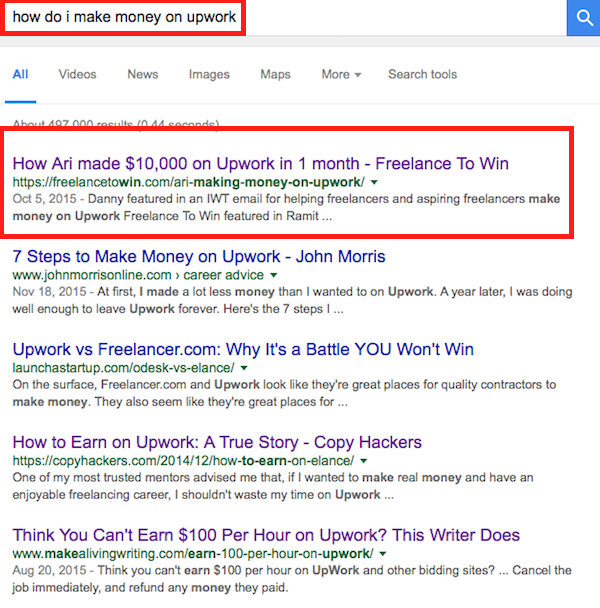 Danny Margulies at Freelance to Win writes about how to make money on Upwork, and he gets plenty of search traffic because he ranks #1 for this term. However, be careful about selecting SEO as your primary traffic generation strategy, especially as a beginner. Despite the obvious appeal of search traffic, it’s not the best approach for everyone. But that doesn’t mean you should ignore it altogether. If you know how to build relationships and connect with influencers, having them share your work is a great way to get introduced to new audiences. Publishing your content on sites or platforms with significant built-in audiences is a popular way to get more visibility for what you produce. 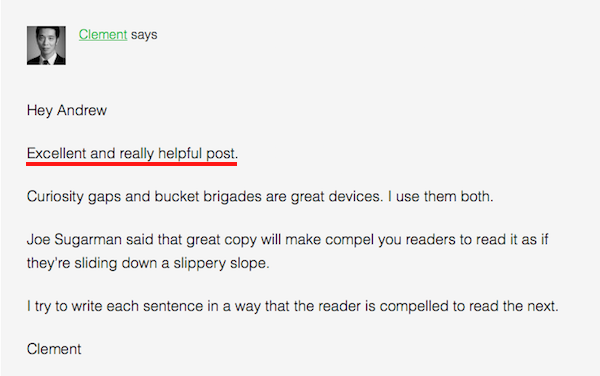 Two common approaches for this strategy are writing guest posts and contributing to 3rd party sites like Slideshare. When you have a critical mass of people in your audience, who are also sharers, they can serve as a valuable army, quickly disseminating the word about your content. Social platforms are designed for sharing and connecting. If you establish a following where your audience hangs out, it can be an excellent way to reach new people and get them back to your blog. The last component of your content strategy often seems like a minor detail, but not giving proper attention to this essential element can mean the difference between reaching your goals or not. It’s all about conversion. Specifically, the content elements that make it clear what next action you want your audience to take, and making it easy for them to do so. For instance, let’s say your ideal reader comes across a piece of your content on Twitter. They get to your website, read the content, and love it. Once they’re done, they say “that was great” and off they go, never to be seen again. You did all the hard work to get your ideal reader to your site, but you didn’t have content in place to close the deal. Shame. To prevent this unfortunate occurrence, make decisions in advance about what specific content you need to convert your audience to the next step in your continuum. Here are some examples of the conversion choices you could make in each of your audience stages. 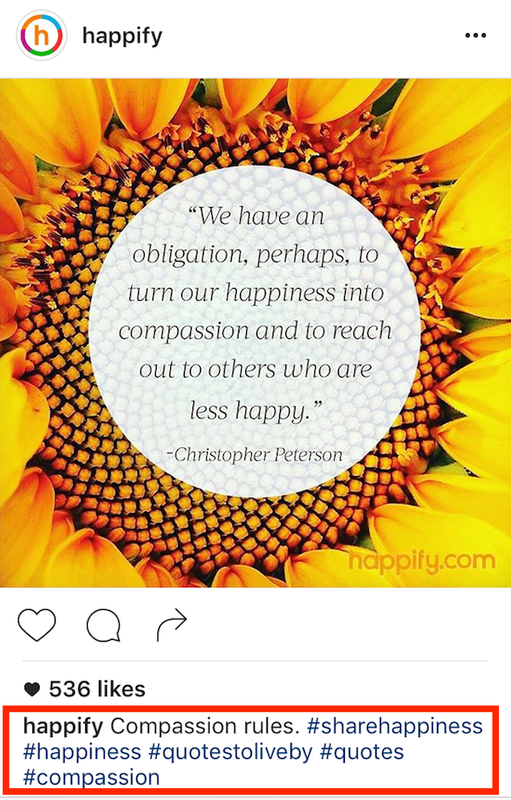 Here’s how Happify uses relevant hashtags to increase discoverability on Instagram. 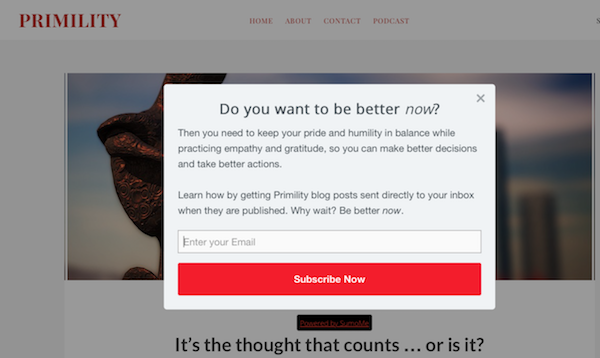 To turn readers into subscribers, Primility uses an exit intent pop-up box that appears after someone finishes reading a blog post. To turn subscribers into loyal fans, Marie Forleo encourages her audience to leave comments on her videos and gives explicit instructions on how to do it. 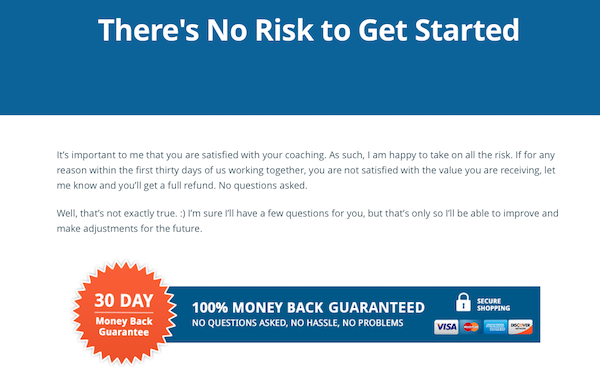 And to help convert loyal and engaged fans into customers, I include a money-back guarantee on my coaching sales page. In each instance, the bloggers make it clear and easy for their audience to take the next desired step. 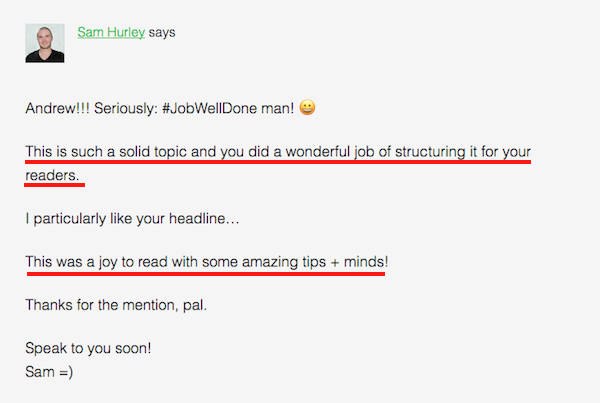 You invest too much time and energy in your blog to accept a ho-hum response. But the truth is, randomness is killing your chances of success. Without a coherent strategy for turning strangers into subscribers (and maybe even customers too), you’ll burn out before reaching your destination. You don’t have to create a complicated plan—you just need to work out what content will move people from one stage to the next. 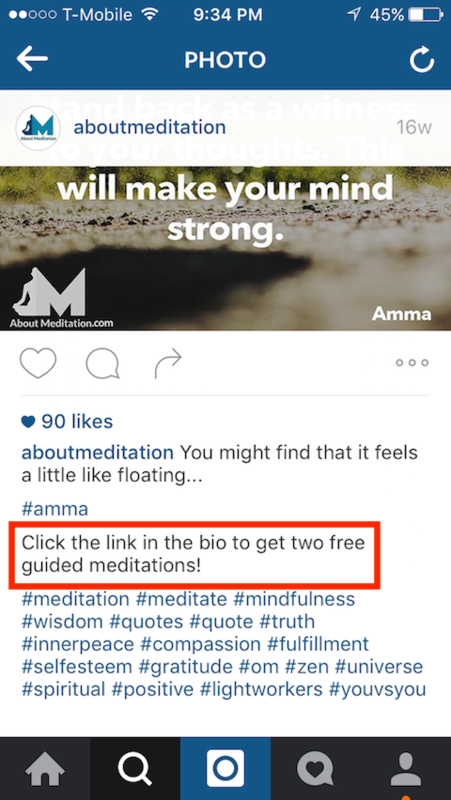 So, start a blog using a simple content strategy and see how it gets real results. About the Author: Sonia Thompson is a content marketing strategist at TRY Business School, where she helps entrepreneurs create and execute plans that get results. Grab your free 5-part email mini-course on the five essentials you need to effectively implement your blog’s content strategy (including a handy-dandy content strategy worksheet). Access it here.